The Mage Arena Dungeon may be small, but it is used mainly due to the fact that it is one of only a small handful of banks in the Wilderness (others include Bounty Hunter, Fist of Guthix and Stealing Creation). 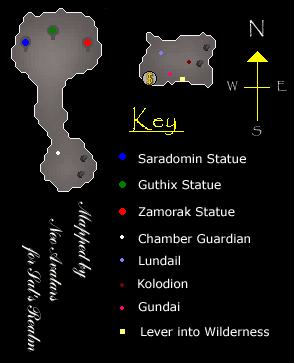 It can also be used as a safe haven from Revanants, as it is not in the Wilderness, so no PKers can reach you there. Be warned: If a PKer blocks you from teleporting, you will no longer be able to use the lever to teleport in and out. It can be accessed by pulling the lever in level 55 Wilderness. The arena is also the setting for the Mage Arena Activity. The Mage Arena entrance is found in level 55 Wilderness, a short distance past the gate separating Freeplay and Members Wilderness. You can either walk the entire way (not recommended), or pull the lever in the house in the northwest part of East Ardougne to be teleported to level 51 Wilderness. You'll find yourself to the east of the arena. Now just pull the lever inside of the house near the northern wall of the arena to be teleported to the dungeon! There are two rooms in the dungeon the first one has the Bank and a Rune Shop in. While in the second room you can buy the God Staves and get the God Capes. 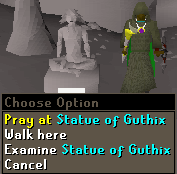 This is where you appear when you pull the lever in the Wilderness. There is a Rune Shop that will stock a small number of all the main Runes used in combat for low prices, a Bank and you can start the Mage Arena Activity in this room too. To access the shop you must talk to Lundail or chose to Trade with him. The Shop is quite often out of Runes, but when there are Runes in stock they are cheap. The Elemental Runes never cost more than 4gp. By talking to Gundai you can access your Bank and get out your equipment for whatever you are doing. Many clans and PKers use this Bank to re-stock on Food and Runes. It is also a popular place for Clans to group before and after trips. You can talk to Kolodion to to start the Mage Arena Activity and once you have killed him in all 5 forms he will tell you how to cast the spells outside the Arena. You can only access the other room once you have killed Kolodion in all 5 forms, but once inside you can get the God Staves and Capes. 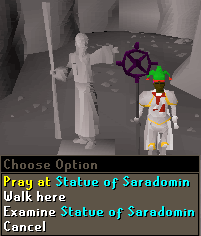 At the far North of the room are statues representing each of the main Gods - Saradomin, Guthix and Zamorak. When you Pray at one of the altars, the cape of that god will appear in a puff of smoke. If you try to pick up a Cape when you already have one you will get this message. By talking to the Chamber Guardian he will tell you about the Charge Spell and you can access his shop to buy the God Staves. 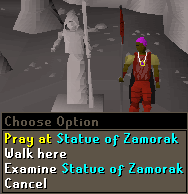 He will give you your first Staff for free, but after that they will cost 80,000gp each. There is a Sparkling Pool in both rooms in the Dungeon and by stepping in it you will go into the other room. When you select to step into the pool a message will come up in your chat screen and if you click away from the screen when you can see this message you won't step into the pool. When you do step into the pool you will disappear and water splashes will come up. 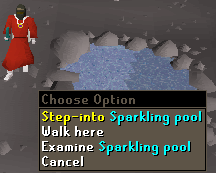 To leave the dungeon you can either teleport out or pull the lever and appear back in level 55 Wilderness.